enough of these unfinished malls! Last Sunday during a chat about various irritations Uganda presents on so many levels, Peter Kagwa suggested that as a country we should go on a management retreat. The ‘Management Retreat’ is a corporate tool commonly used to allow a team to re-assess and strategise over an issue in a fresh atmosphere of openness and deep introspection. Sometimes teams go on annual scheduled retreats at points such as the start of the year, and other times retreats are conducted over an issue if it is major enough to significantly threaten performance. The Retreat as a beginning to solving a major national problem is much better than an earlier suggestion made by a young lady friend of mine irritated by everybody on the road between her home and workplace: “All Ugandans should just go and sit in a corner and first think about their lives!” she screamed. Peter’s arrival at this solution was the result of years of frustration as an Events Manager with a keen eye for detail and perfection, but was exclaimed because we had spent fifteen minutes talking about the Westgate Mall in Nairobi and comparing it to Forest Mall here in Lugogo. I have been to Westgate and need not go into the detail of its finishing and function. 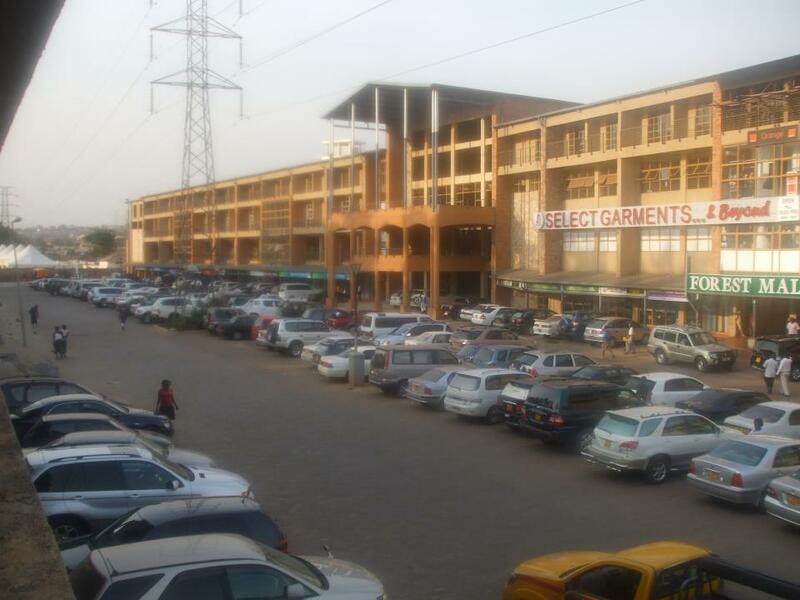 I could depress you all further by talking about the Levy Mall in Lusaka, Zambia – built by their pension funds body and named after former President Levy Mwanawasa. The Malls in Zambia irritate me a little bit because they are only opened to the public after full completion, they are fully occupied, properly equipped, and they are clean and neat. Forest Mall, in comparison, is a dump – and we will talk about the others later. Borrowed from http://www.skyscrapercity.com – thanks! I am not afraid to say this because it is true, and my lawyers trust that I cannot be sued by a half-complete building that is masquerading as a Mall. A little of my negative feeling about this Mall is memories of pressure from the need to visit the toilet when I used to go to the Patisserie at the end. This Patisserie opened up some time last year without toilets or washrooms and has confidently gone on serving tea, coffee and food without these amenities in place. The first couple of times I went over they said “under construction” and “ready next week” and then it just became embarrassing. Like an idiot, the third time I actually held back from asking them when they planned to open the loos, and bought a couple of things to take away instead, then I realized that doing so was actually financing the backwardness involved in having a restaurant without washrooms. The annoyance at this place starts right at the gate where askaris pretend to search cars while actually asking for “water” and calling you “boss” and “sir”. Essentially, a terrorist is charged just Ushs500 in cash to drive in with a car bomb and gets to be called “sir” while going through. When walking into Forest Mall itself, by the way, you have the option of walking in through the right hand side where the askaris will run a probe down your side, or a little to the left of them where they will either ignore or smile at you walking in. It’s uncanny! Sometimes you imagine that there is a secret search mechanism that relays x-ray images to a room on the top floor of the building where high-level security agents in black uniforms sit watching computer screens. But on the top floor there is nothing but building materials being patiently put together to create the top floor! The food at the very popular café downstairs – Simba – is very popular but sadly, I will be missing it till the disorganization is sorted out. Should Kagwa have his way, I’m nominating the owner of this mall for a prime seat in one of the first buses heading for the retreat. Not in any of the front seats – those are for the city planners. I’m writing this while watching an episode of QI (Quite Interesting) hosted by British Actor, Author, Screenwriter, Comedian, Playwright, Journalist, Poet, Comedian, Television Presenter, Film Director, Board Member of Norwich City Football Club, and celebrity-most-recently-photographed-next-to-Simon Kaheru, the one and only: Stephen Fry. First of all, I must stress that I am the type of Ugandan that will not run around trying to get photographed next to celebrities. I have only done it with, besides Fry: Bono, Chris Tucker, Bill Clinton, George W. Bush and his wife, MANY Ugandan celebrities such as Isaiah Katumwa, Maurice Kirya, Juliana, Iryn, and others. So when Stephen Fry tweeted that he was coming to Kampala, I pretended a little that I didn’t care too much and even warned him in passing that he should avoid the sins of Jeremy Clarkson. I therefore went about my day quietly hoping that Fry wouldn’t be chaperoned round Kampala by some idiot focussing on brothels, slums, and funny places run by the worst possible Ugandans available. I actually hoped at one point that he would get to eat at The Bistro at Kisementi or Java’s Cafe in Kamwokya, and when Cedric Babu called me up to ask if I knew the man’s programme, I denied but we discussed our shared hopes. Still, I didn’t make it my business to do anything about it right up to the second he tweeted a photograph of Fat Boyz. Beer + Food. ‘Nuff ‘Sed! The guys behind Fat Boyz should pause and think a little bit about what this opportunity really means: Fry has 5,481,924 followers. That means that there is a likelihood that that many people now know about Fat Boyz and that Stephen Fry said, “Mmm…inviting” about it. The value of that advertising? 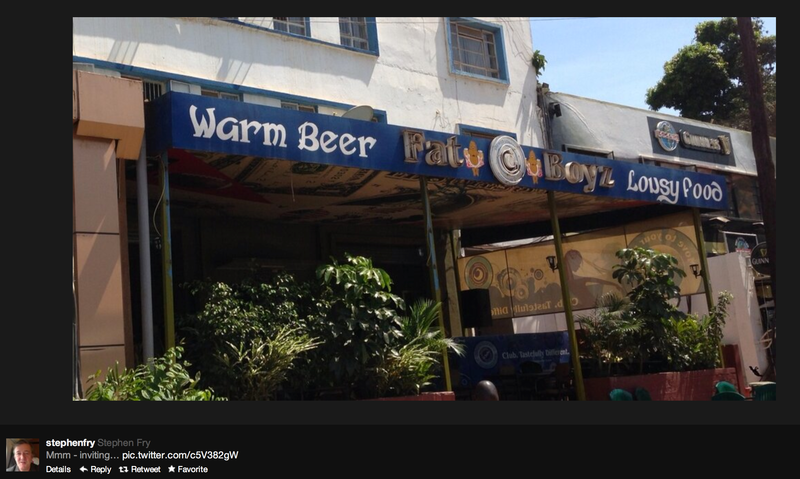 THIS IS HOW TO PROMOTE TOURISM or MARKET A PLACE! Anyway, I happened to be rushing back to the office out of the debilitating sunshine, having missed lunch due to the speed of shopping attendance at some Kampala shops, and had just turned down a mental suggestion to pop over to the Java’s to pick up a quick bite when this photo appeared on my timeline. Just as we turned into Kisementi, even sitting there in the Toyota Progres (not mine, the wife’s) I looked up towards the Kisementi buildings and saw the fellow towering over the cars in the distance making his way as-if to The Bistro. My heart leapt – not at the thought of meeting him, but in the hope that he would have only good things to say about Kampala and Uganda if he was going to lunch at The Bistro rather than (too many places to name). But then, right there where the policemen normally open your car door and engulf you with the air of their malodorous armpits, was a Rwenzori Water truck parked across the road. Long story short, the truck appears to have knocked the boom gate at Kisementi and its driver and turn-boy were now fixing it up using their tools. In order to do the job uninterrupted by people driving past, they had parked their truck across the entrance/exit and therefore blocked all traffic. Apart from Stephen Fry, the rest of you probably have a good idea how bad the parking and driving situation at Kisementi is, exacerbated by the construction of the Acacia Mall. Now, here were two buffoons voluntarily adding to the chaos, having stupidly driven their truck into the gate. The two polite policemen who explained to me what was going on, of course, were not to blame for having NOT opened the boom gate in time for the truck to go by, and pretended that their ‘block-the-gate-with-truck’ solution made full sense. As I was engaging in this inane discussion (straight out of a comedy plot, I tell you, but this was real life!) I noticed that Fry hadn’t gone into the Bistro and seemed to be approaching a car. I abandoned mine with the driver and moved in for the kill, not sure exactly what I was going to tell him but planning to speak up for Uganda and against any Jeremy-Clarksonism, while campaigning for anything positive from him. Unshaven and in shorts, he was clearly on holiday, and his genial smile told of a very good lunch behind him. “Of course,” he gently acquiesced to my request, but with his car door open and clearly in a hurry to get on with the holiday. Luckily, Kampala being as small as it is, the brother-in-law of one of my brothers happened to be walking by and obliged us by taking a few shots. Very kindly, he positioned himself to provide me with some shade from the scorching sunshine, and stayed still long enough to take some inane banter that will NEVER qualify me for a panel shot on QI, and shortly thereafter said his goodbyes and entered his own Toyota Progres. Into which he easily fitted and sped off…to join the traffic jam caused by the Rwenzori Water truck, the two idiots driving it, and the lazy policemen stationed there. 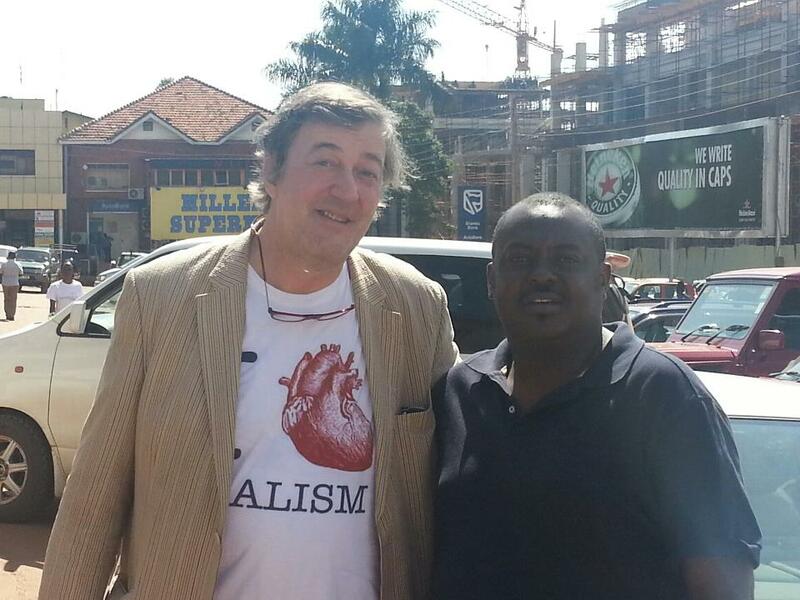 Enjoy Uganda, Stephen Fry! And don’t say anything bad or we’ll be on your case like you’re a Jeremy Clarkson. Go see the wildlife, eat the local food, and if you meet any daft Ugandans doing stupid things, join us in laughter but believe me, they don’t represent ALL OF US unless you happen to be in Parliament. are you ready for the kenya election rains? BACK in our primary school days, those of us in urban areas were constantly told to pack a sweater, carry an umbrella, wear gumboots, and often heard proverbs such as, “a stitch in time saves nine” and the Boy Scouts motto, “Be Prepared”. Last year, on March 15, the date of this year’s national election in Kenya was announced. (It’s obvious where we are headed, eh?). This gave us, Ugandans, one full year’s notice to prepare for all eventualities from elections over at the neighbour’s. The last time they held elections – more than five years ago – violence and chaos broke out with effects that spilled over the border and disrupted our lives. I worked with a multinational corporate organisation then, and needed to get our product exported to international customers on time through Mombasa. We were jittery then because we had seen operations whittled down for various reasons, including two years in which the Jinja highway to the border was muddy and chaotic because a road construction firm had stopped work midway. Plus, unstable logistics support from different companies that refused to do simple things such as keep time, update you when things weren’t going to work, or reply requests for information to help you plan. We were in a bad place, then the Kenyans took up machetes for reasons other than preparing nyama choma! With many others, traders and exporters alike, we lobbied high and low to establish an alternative route, railway lines, ferries, and roads to Dar es Salaam. We sent teams driving down to calculate what it would cost us to switch from Mombasa to Dar for export, which trip took so long we even forgot about them at one point. But wait – ‘Applause, Applause!’ – two weeks ago, the governments of Uganda and Tanzania announced that they had reached a deal to take our (Ugandan) goods through Dar es Salaam. This short term fix is just what we needed at the end of a five-year window during which a long-term, high benefit solution could have been found. What else are we doing about this, as Uganda? The CEO Magazine, a small but interesting publication, addressed this issue in April last year, gathering views from various players and declaring us to be hopeless. The only piece of good news was the upgrade of the Kampala-Dar es Salaam Route, bringing down transit times from 29 days to four (4) days only – but only 5% of our outbound cargo goes through there! I went to Google to find more and on the home page of the Uganda Export Promotion Board – www.ugandaexportsonline.com found a story uploaded on 1st December 2011, as well as, on the list of events for this month: ‘Fruit Logistica – Berlin 2011’. Not one to quibble, I addressed a polite gentleman over the Ministry’s plans ‘just in case’. He even more politely asked me to ask the Permanent Secretary (PS), the only official authorized to speak for the ministry. But the PS was on leave, and though I enjoyed the pleasant politeness of all the phone handlers, nothing of great importance ensued. I could have called the Private Sector Foundation, Uganda National Chamber of Commerce and Industry, Uganda Investment Authority and other abbreviations but the exercise was fraught with a sense of doom. Like seeing the sky turn dark with signs of an impending storm and then walking down a Kampala street trying to check if anyone has an umbrella or raincoat inside their cars. I hate this hot weather, even though it hits me every year and I should be accustomed to it. Nobody is helping to make it more bearable – not even people who could be making some money and improving the entire damn country while they’re at it. Where, for example, are the soda, juice and water companies in all this heat? It is amazing to NOT see them setting up vendors with coolers and ice packs on every street corner. Meanwhile, the fellows who sell sunglasses mid-traffic are taking a break from the sun themselves; and there is absolutely no single discount to be seen on fans or air-conditioners anywhere. All this struck me one evening last week when my three-year old stripped naked and rejected all offers of nightclothes. I realised we had to go out and buy her much lighter clothing for the season and did so – but only after spending hours searching for appropriately light clothing, because apparently shop owners in Kampala are totally unaware of this annual heat phenomenon. They know Christmas and ‘Back to School’ but the hot sunny period in between has escaped their attention for the last ten years, yet in 2003, Uganda was named ‘the most entrepreneurial country in the world’. At that time, I suspected that the authors had counted the number of hair salons, airtime kiosks, clothes shops and bufunda in Kampala, divided those among the number of Ugandans as per the last census and viola! In 2010, the same surveyors released another report, titled “The Global Entrepreneurship Monitor: GEM Uganda 2010”; a 64-page survey led by none other than Waswa Balunywa, Principal of the Makerere University Business School (MUBS), and fore worded by Denmark’s Ambassador to Uganda then, Nathalia Feinberg. We had dropped to sixth position out of 59 countries surveyed. It appeared that this Ugandan entrepreneurship was a true story. The report even distinguished between entrepreneurship motivated by necessity from that motivated by opportunity, and said other things. But in this heat, I am unconvinced – and the report didn’t help by forgetting to define “entrepreneurship” at any point, which debate could be lengthy, but my side demands that innovation be factored in. I’m mostly positive thinking but I’ve never understood the foolishness in planning business areas in my part of the world. Anyone who’s played Monopoly notices quickly how the board forms a pattern of logic – properties grouped in estates, four stations equidistant from each other, utilities apart and a fair distance from each other, and Tax, ‘Chance’ and ‘Community Chest’ points wisely positioned. In Uganda, every business street in any town is hotchpotch (aka katogo – a potential entrepreneurial opportunity that few have hit upon thus far). Women array themselves in vegetable markets next to one another selling entula, matooke, avocado and whatnot at the same general prices, with the same level of sombreness, and none ever attempting to look prettier than the next or smile you into buying theirs rather than their competition’s. As if Biblically, wherever two or three hair salons are opened up on any street, there also will be a third, fourth and fifth. I know a road in Makindye with seven hair salons side-by-side, each with a couple of women weaving hair, a drying machine (maybe just a towel), and a barber cutting men’s hair. None is ever busy. Each of them also sells airtime, drinks and a couple have added biscuits, dry cells and whatnot. ‘Take-away food’ is generally ‘Take-away food’ as if the menu – the recipe for the food as well as that laminated grimy card listing the food names – were issued by a strangely efficient government department. All these are NOT entrepreneurs. Call me an ‘entrepreneur’ and I feel innovative, like I could create a solution to a problem and along the way earn money from it for thirty years from many people I don’t know but who will be grateful and say my name in awe – Steve Jobs/Bill Gates/James Mulwana. The reality of course has me pausing for breath every time I see announcements by banks, bailiffs and the Uganda Revenue Authority, so I maintain a cosy social relationship with many people along my business financial chain. Most of us are mere businessmen and traders, not entrepreneurs. In the GEM report there’s a photo of two women with baskets of bogoya on their heads walking past the KCCA (Kampala Capital City Authority) offices. Entrepreneurship? Lol! The entrepreneur is the person who chops up the bogoya, mixes in more fruits, pops them into a fridge at 0500hrs and then turns up at my desk with a price tag of Ushs1,000 when the sun is overhead blinding me as I desperately count out the notes for three packs, and make small talk to ensure he returns the next day without fail! The entrepreneur is the fellow who gets soda, juice and water companies to provide coolers on every street corner for the months of January and February, with a sign reading, ‘Cooling Stage – sponsored by KCCA’ overhead, and paying Ushs50 to KCCA from every drink sold, and a guarantee that from March to August he will place garbage cans at that spot and label it, ‘Cleaning Stage – powered by KCCA’ for a small fee of Ushs50 per kilogramme of garbage collected there. Entrepreneurs? Nobody has even opened up a second ice plant besides the one in Luzira. Air Conditioning should be running bigger promotions right now than banks selling unsecured loans…or banks should be selling loans to buy air conditioning units. Even when the heat caused people to assume a coup was imminent in Uganda, no creative thought ensued. Any insurance companies offering to cover you in case of looting? Airline companies offering tickets to exile? Real estate companies selling land far away from Kampala? Zero. It’s in the heat of the moment that you identify entrepreneurs. And the field is as dry as a desert.